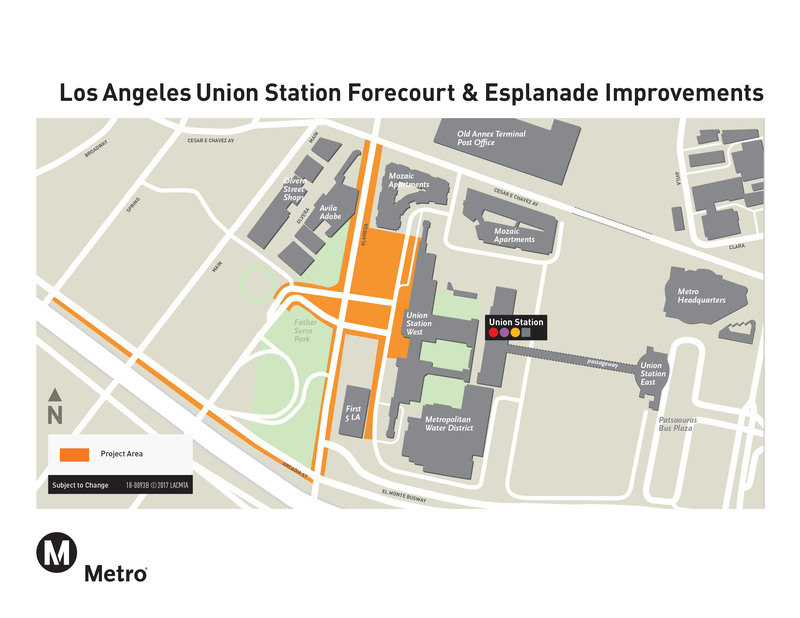 The Los Angeles Union Station Forecourt and Esplanade Improvements project will enhance safety and improve pedestrian and bicycle connections between Union Station and surrounding communities. 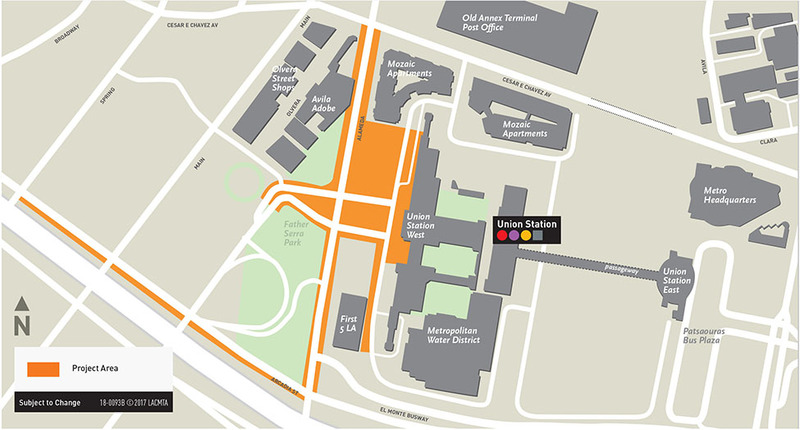 The proposed project is located in front of Los Angeles Union Station and on adjacent streets. The proposed improvements create a useable civic plaza, and provide enhanced pedestrian and bicycle connections between the station and surrounding businesses and communities. Designated parking for El Pueblo tourist bus at the curb along the eastern side of Arcadia St between Alameda St and Spring St. Restrictions on tour bus parking during peak/rush hour. Metro is in the design process and will be engaging stakeholders throughout. 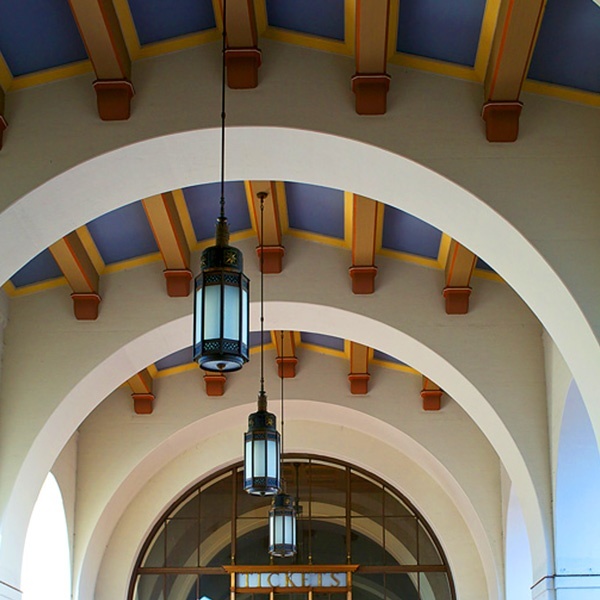 Metro initiated the environmental review process (California Environmental Quality Act (CEQA) and National Environmental Policy Act (NEPA)) for the Los Angeles Union Station Forecourt and Esplanade Improvements project in December 2016. Metro has secured Active Transportation Program grant funds that contain federal monies, which will require compliance with NEPA. The California Department of Transportation, acting on behalf of the Federal Highway Administration serves as the Federal Lead Agency. Addendum to the Final Environmental Impact Report (FEIR) and updated Mitigation Monitoring and Reporting Program. 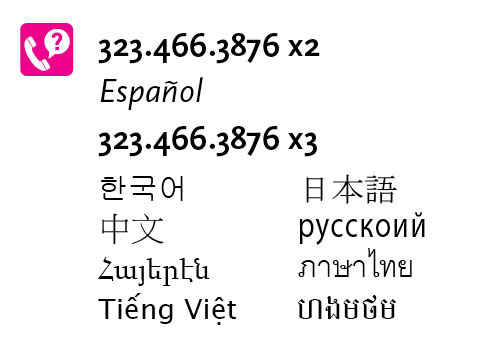 Approved by the Metro Board on July 26, 2018. Metro released the Draft Environmental Impact Report (DEIR) | Appendices for this project on August 11, 2017 via this Notice of Availability .